Come on sing it with me now?? Who has carols pumping through the house and their tree up? Now that we are in the spirit let's round the bend and get our cards done and out the door! I'm BACCCCKKKK!!! And today I bring a quick tutorial on how to add and change out drop shadows! In this tutorial I am using CS6 version, in PSE you can follow along in most versions until I separate the shadow onto a new layer. In older versions of PSE you cannot put the shadow on it's own layer but you can still change the color... and of course I will show you how! To get started open up the template for the card #10 given to you in the email. 1) Choose a chunky or bold font to type out your title. Here I used Cooper STD, which is free. 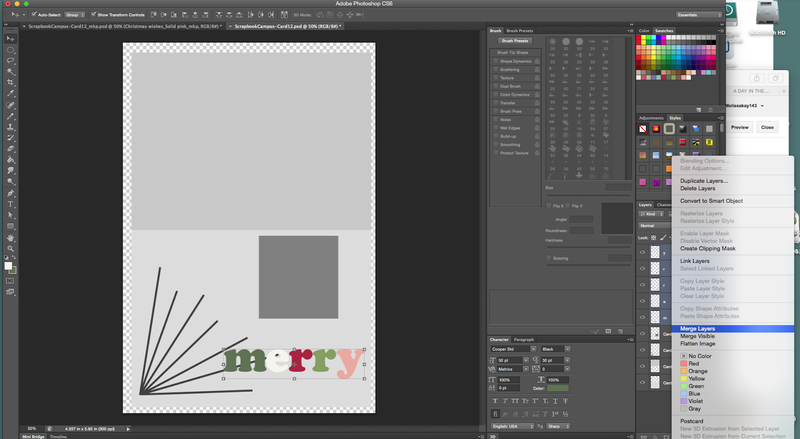 2) I typed each letter of "merry" on it's own layer, so that I could change the colors or add pattern as I desired without changing the whole word. 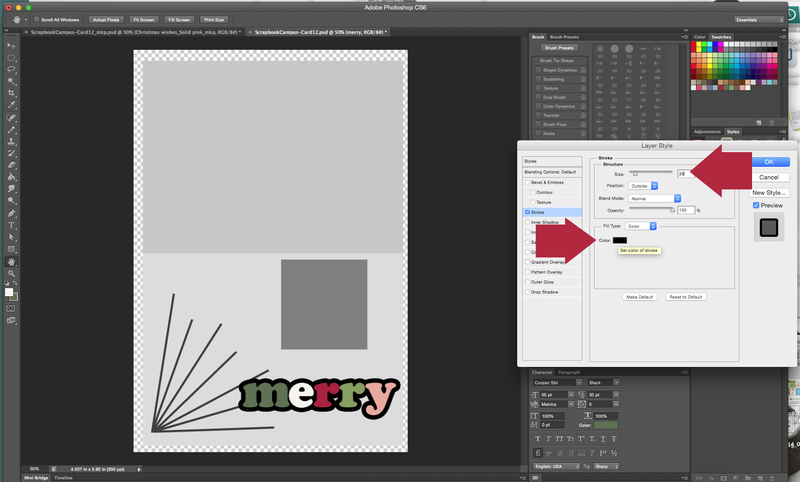 3) Use the tutorial on alignment and distribution from Dec 2nd (here if you missed it). 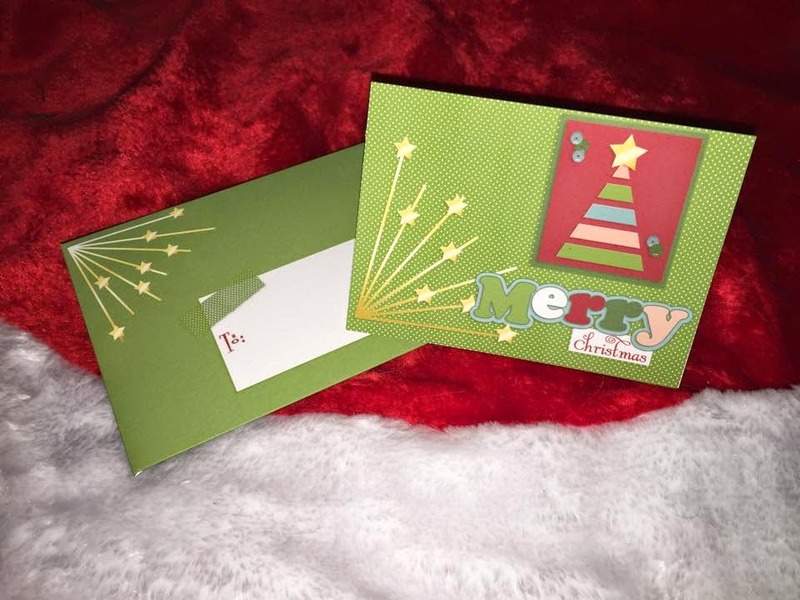 4) Now I used papers from the kit this card was made from because I like the texture added in. But you can easily just change the color of the letters to suit your needs. 5) Now that each letter is complete with pattern paper, you can merge it and make it into one word. 6) First you need to rasterize the type and then make them all one layer. Select ALL the layers of the word you are working with. 7) Add a stroke to the word. I used size of about 20 here. FOR PSE USERS... HERE IS WHERE YOU CHANGE YOUR COLOR TO MATCH YOUR CARD. CLICK JUST TO THE RIGHT OF THE SIZE LINE AND THAT IS YOUR COLOR CHANGE OPTION. 8) Put the stroke on it's own layer by clicking the word "Stroke" on the layers panel and using the drop down menu that says "Create layer"
9) Once it is on its own layer you can manipulate the color and or add another pattern to it as well. 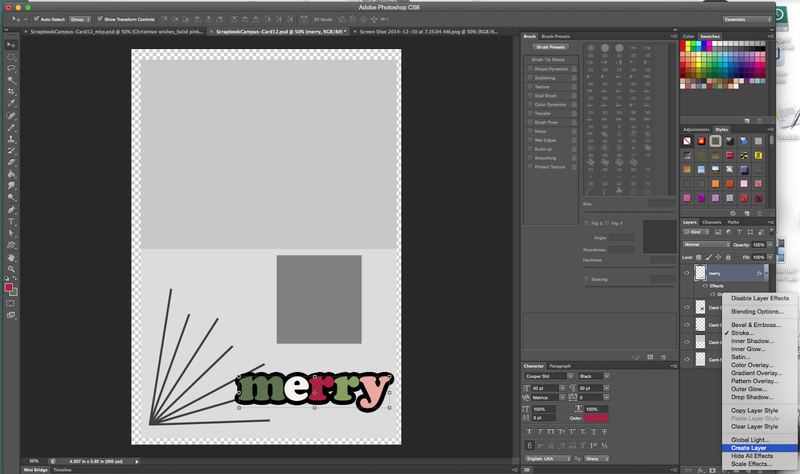 10) Finally I decided I needed a little more oomph to the word so I added a SECOND stroke to both the "merry" and the stroke outline... only at 7 this time and a green to make them pop. 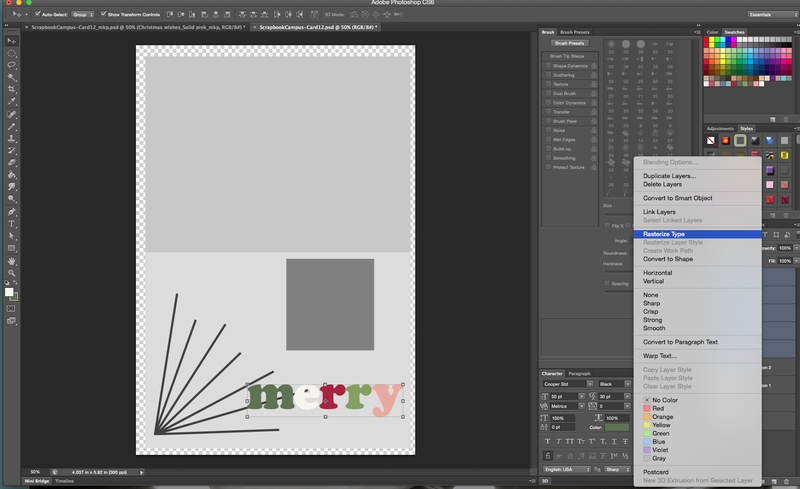 11) Add in a small drop shadow and you have a beautiful title on your card. Note: You can do this for more than just words. I repeated this WHOLE process to add an exact matting around the rectangle in the template so I wouldn't have to guess size or alignment! Give it a try! Here is my finished card... Be sure to share yours with us! ENJOY! It's not to late to share the fun with friends.. get them in on the 12 Days of Christmas cards and envelopes by signing up here. 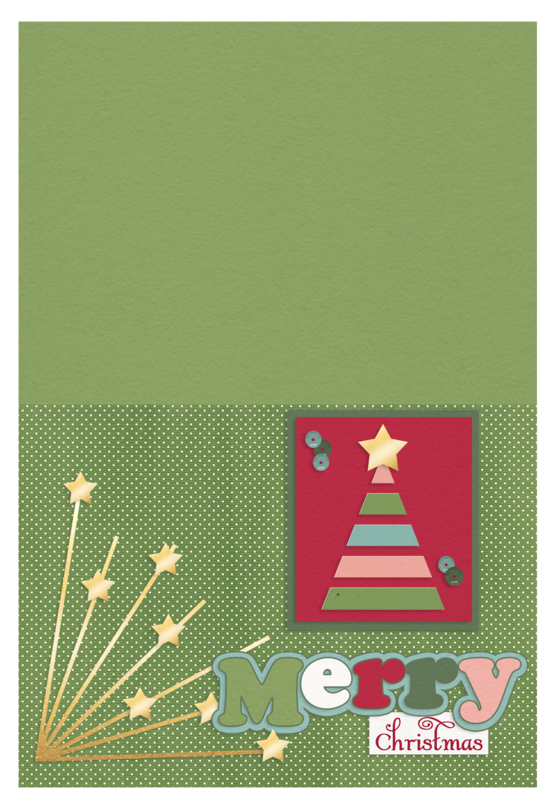 For this card I used the "Christmas Wishes" Digital kit that can be found in my shop at the "store" tab!